The water here at Stocks is back up to healthy level and reservoir is looking beautiful. You can now fish the Northern Shallows once again and behind Willow Island. This newly flooded ground in these shallow areas was covered with a good sward of grasses and plant life and now offers new feeding opportunities for the trout. Mountain minnows are abundant in the margins and the trout will, no doubt, soon be taking advantage of this valuable source of protein. We have had hatches of olive buzzers from several areas including Bell Point, Hartley’s Bank, Grindy’s and Newclose Bay. We have also had sporadic falls of terrestrials including small black flies and daddies that have given rise to localised hotspots for dry fly fishing. These have occurred off the east bank around Black House Bay and over the main Basin. The fishing has remained tricky however, the best methods have been dries when the conditions suit with daddies, claret hoppers and black bits and sinking lines with fabs and boobies on the brighter days or less clement days. We have continued stocking trout throughout so there are loads of trout at large in the water at the moment including a full quota of prize tagged fish. The next scheduled competition on Stocks will be the Stocks n Shares competition on October the 15th. However a new date for the rescheduled Stocks Pairs Match will follow shortly. Bank House Fly Fishery has been fishing steadily away with good catches coming to Damsel patterns, minkies and black taddies. Egg flies have taken their fair share of fish as have small wets fished in the top foot of water. This entry was posted in Stocks Reservoir Fishing Reports on September 21, 2016 by staff. This entry was posted in Stocks Reservoir Fishing Reports on September 7, 2016 by staff. Monday 29th August – Monday 5th september. Although the fishing has still been tricky with the trout not responding quite as they should there have been fish caught but a number of anglers are saying they are getting chances but the fish are either not getting hold properly or dropping off during the fight so there are signs of sport improving. One such angler was Bob Fitzpatrick who had over a dozen solid takes to either pink or black snake flies whilst fishing around willow and gull island. Biggest fish of the week was a 9lb 3oz rainbow which was caught by first time visitor to stocks Gyorgy Goskavits. 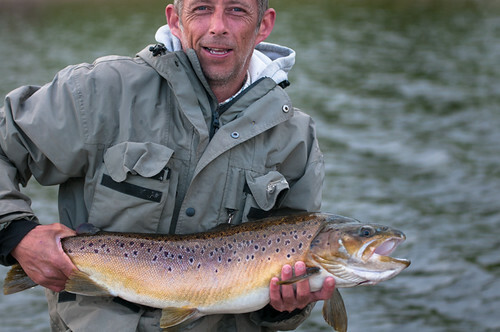 Gyorgy caught his big fish from the dam wall on a red dry fly. Bill Tennant had a half day and landed 3 fish and had other chances whilst fishing in Hollins bay. Bill caught his fish on a brown fritz tadpole with an orange bead head. Landing 4 trout from Hollins and Bens beach was Nigel Blackley who also caught on tadpole lures. Best areas to try are Hollins bay, both willow and gull island and tight in to the dam wall, i have also seen numbers of fish at Haighs hollow and over the Hodder trench. Last bank holiday Monday we held a charity match in aid of the north west air ambulance, a great cause. The winners of this blind pairs match were Mark Tyndall and Dereck Moore. With donations and raffle ticket sales a total of £350 was raised for this worthy cause. Well done and thanks to all who contributed. On Friday Ben made a stocking that included double figure rainbows and blues and there will be another stocking made again tomorrow. Syotw Paul. This entry was posted in Stocks Reservoir Fishing Reports on September 5, 2016 by staff.